In the previous studies, it has been shown that the classical constraint satisfaction problem (CSP) is deductive in nature, and can be formulated as a classical theorem proving problem [1, 10]. 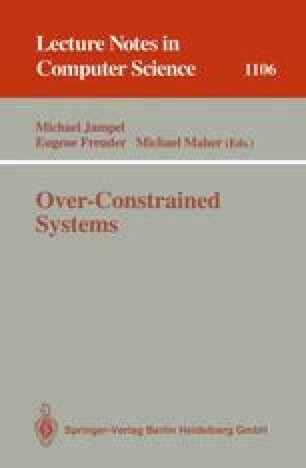 Constraint satisfaction problems for which an assignment of values to all variables which satisfy all available constraints is not possible are referred to as over-constrained problems. This paper shows how computing partial solutions to over-constrained problems can be viewed as a default reasoning problem. We propose two methods for translating over-constrained problem specifications with finite domains to two different variants of default logic. We argue that default logic provides the appropriate level of abstraction for representing and analyzing over-constrained problem even if other methods are used for actually computing solutions.